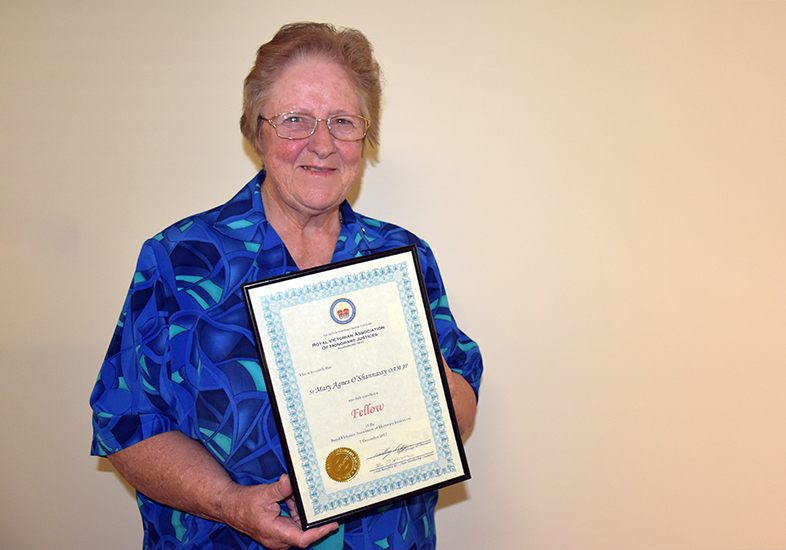 Sr Mary O’Shannassy, CatholicCare’s Director of Prison Ministry, continues to garner recognition for her outstanding contribution to the Victorian community. On Monday at a meeting of the Royal Victorian Association of Honorary Justices (RVAHJ), Sr Mary was awarded a Fellow of the RVAHJ, in recognition of significant service and ongoing support. Sr Mary has been a Justice of the Peace for fifty years, both here in Victoria and in NSW, and continues to be one of the few JPs who are available after hours. Following the Order of Australia medal received in 2017, and the commemorative pin acknowledging 20 years of service at Port Phillip Prison last November, Sr Mary can now add a new award to her collection - and another post nominal to her name.